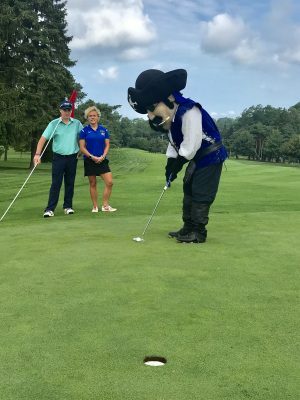 OSWEGO, NY – The Buccaneer Boosters Golf Tournament will be held September 22 at the Oswego Country Club, according to Buccaneer Boosters President Sean Callen. The Oswego Buccaneer lines up a putt recently at the Oswego Country Club as Oswego High School Varsity Golf Team member Cole Cullinan and Oswego City School District Athletic Director Rhonda Bullard look on. 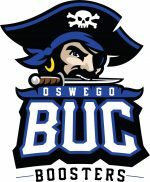 The Buccaneer Boosters Golf Tournament will be held September 22 at the Oswego Country Club. Sign-in starts at noon and the shotgun start will be at 1:30 p.m. 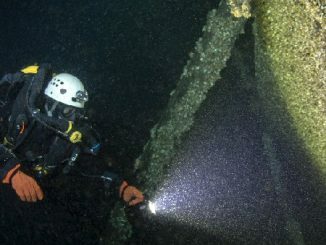 The tournament will be a four-person captain and crew format. The cost of $400 per team includes 18 holes of golf, two carts per team, and dinner immediately following the tournament. According to Callen, limited spots remain, so please reserve your team today. Sponsorship opportunities are also still available and welcomed.